10/26/2010. A Cuban Visual Arts Salon was inaugurated in front of many people in the Granma Room, from the Cuban Embassy in Mexico, in memory of the Cuban Culture Day. 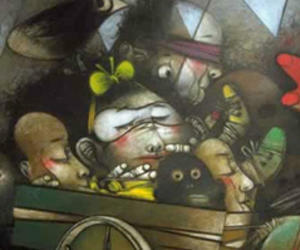 The show, includes 37 original pictures by a group of the most important contemporary Cuban creators, such as Roberto Fabelo, Nelson Domínguez, Kcho, Agustín Bejerano, Adigio Benitez and Pedro Pablo Oliva, among other painters and engravers from the Caribbean island, according to a report by Prensa Latina. The Visual Arts Salon, inaugurated for the 142nd anniversary of the appearance of the Cuban nationality, will allow in the coming days for an approach of the Mexican people to this strong sample of different stylistic manifestations and tendencies of visual arts work in our country. After cutting the opening tape of the exhibition, the Cuban Ambassador in Mexico, Manuel Aguilera, expressed that culture is one of the strongest bonds that joins the people from the two countries. The Cuban diplomat thanked the painter Mario Gallardo for taking care of the curator work of the exhibition, while he pointed out that by paying tribute to Cuban culture; they are also honoring the historic brotherhood of his country with Mexico. The evening was entertained by the versatile artistic show Cubanísimo, which under the direction of the well known Cuban cultural promoter, Gaspar Gonzáles Lanuza, has been undertaking for several days different presentations in Mexican stages.